Posted November 4th, 2015 by admin & filed under Hand/Wrist. I am fortunate to get so many great, interesting cases cross my path over the years. Since I am blogging now, I want to share one of my most recent case of a hand injury after an attack. 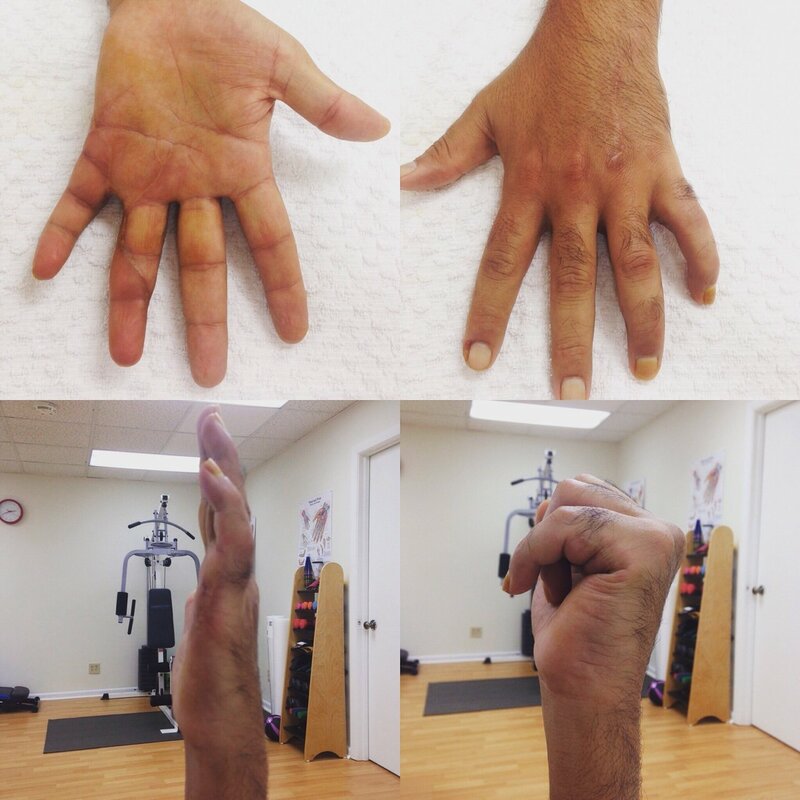 Recently, a young man called to schedule his appointment for hand therapy after hand surgery. Matt’s story is that he was attacked by knife point and during the attack, they cut his left dominant hand as he was putting it out to protect himself. It left deep cuts in his left hand cutting through the flexor tendons in both his ring and small finger and the small nerves and arteries of those two fingers. He went to the ER and was treated by a hand surgeon that pretty much put his fingers back together again. Repaired the tendons, nerves and arteries of the ring and small fingers. After that his surgeon told him to go to therapy right away to get a custom fitted orthosis (splint) and start his therapy. THIS is where it gets tricky. A lot of people always think that because they have stitches or wounds that they should wait until it is healed before going. WRONG!! It is so VERY important to go to your certified hand therapist (CHT) for this type of injury and also to go within the first 3-5 days after surgery. The splint is fitted to make sure your wrist and fingers are positioned in the best way for healing but also motion to regain function of the hand. Wound care needs at the beginning of the therapy process. Matt came right away and was placed in this orthosis, taught his home passive ROM exercises that he did every 1-2 hours that he’s awake. I know…I know…it’s a lot, but it should only take 5 minutes to do. 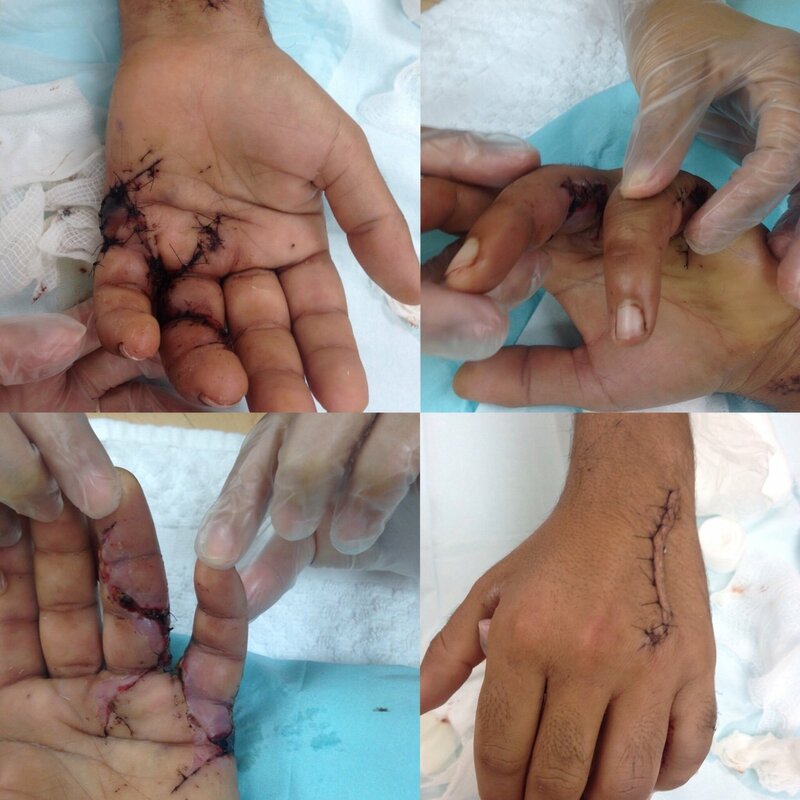 One of the biggest issues is that he had such bad cuts, in difficult areas to heal such as the side of the finger and also between the fingers, the wounds took a lot of time to heal. He also had a lot of swelling of the fingers. Scarring was very thick as well. You can never know how you scar unless you have had surgery before, and also can depend on where. In this instance, I think it was just due to the nature of the injury. But time will reduce the thickness of the scaring and it can flatten and become softer over time in Matt’s case. He was also great at doing his home exercises and managing his wound care at home as well. That’s so huge, being compliant with your home exercises. Even though he had a very bad injury, Matt has regained a lot of function in his left dominant hand. At 4 weeks, he went back to teaching, at six weeks he was able to write again, and at 7 weeks was able to grab light items. Even though the small finger is not very straight, he will continue to stretch that at home, and though his tendons in the small finger are stuck, his ring finger has great motion. At this time Matt can do everything with his left hand that he wants to do. He could maybe in 6 months consider if he needs another surgery to the small finger, but if he can do everything he wants, there’s really no need for another surgery. Functional outcome after flexor tendon injury. Thank you Matt (I know that’s not your real name…) for giving us the opportunity to help you. I hope that we were able to turn a negative into a positive for you! Like the story? Please share! Nice story and nice outcome. Thank you for taking the time to read and comment! That means a lot coming from a fellow CHT. Simply wish to say your article is as amazing. The clearness in your post is simply spectacular and i can assume you’re an expert on this subject. Fine with your permission allow me to grab your RSS feed to keep updated with forthcoming post. Thanks a million and please continue the gratifying work. Thank you! Please feel free to sing up for our newsletter for updated blog posts, or follow us on social media such as Facebook and Instagram.